What is your struggle? A bad habit? Addiction? Unforgiveness? Insecurity? Even when change is in our best interest we resist. We even vilify those pushing us in that direction. The problem, however, is they are not the real villain. The real villain is our behavior. Unbecome everything you were never meant to be. Just as Jesus squared off with the devil in the wilderness, we must square off with our devils. 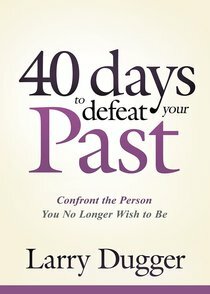 Forty Days to Defeat Your Past is a one-day-at-a-time process that uses the number forty to help readers identify and defeat the destructive patterns of their past. Take on the forty-day challenge and establish new, healthy, fulfilling habits to launch the starting point for you to walk out the life you've only ever dreamed about. About "Forty Days to Defeat Your Past"